TGIF has never had truer meaning than today! It’s been a super long, difficult week, but it’s Friday and things are looking up. I plan on hitting the gym this morning, then taking the kids to a park to eat lunch before we get a ton of rain this week. I wanted to mention that I updated my ABOUT page last week. This is probably the hardest page for me to write. It sat as a Draft for a while, but you can see the updated version here. Thank you for your positive comments on my last post and on Instagram. Lesson learned: You can never be too thorough with backing up your computer and having antivirus software on your computer. 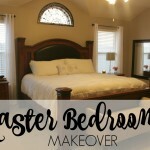 I wanted to share some favorites today and a little bathroom makeover I mentioned a while back. 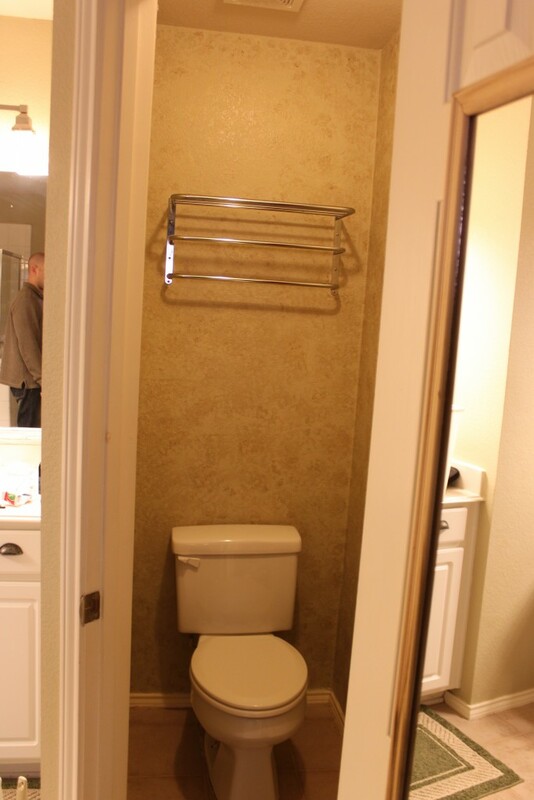 First up is the bathroom. I decided it need a new coat of paint. This was the color when we moved in 9 years ago. I have been wanting to try Benjamin Moore’s “Gray Owl” so I used this space to experiment. 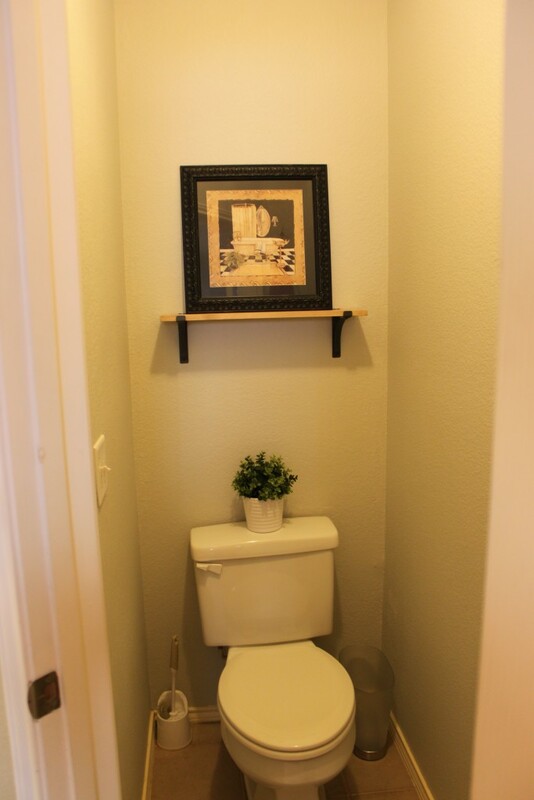 I also wanted to take down that towel rack and add decor. 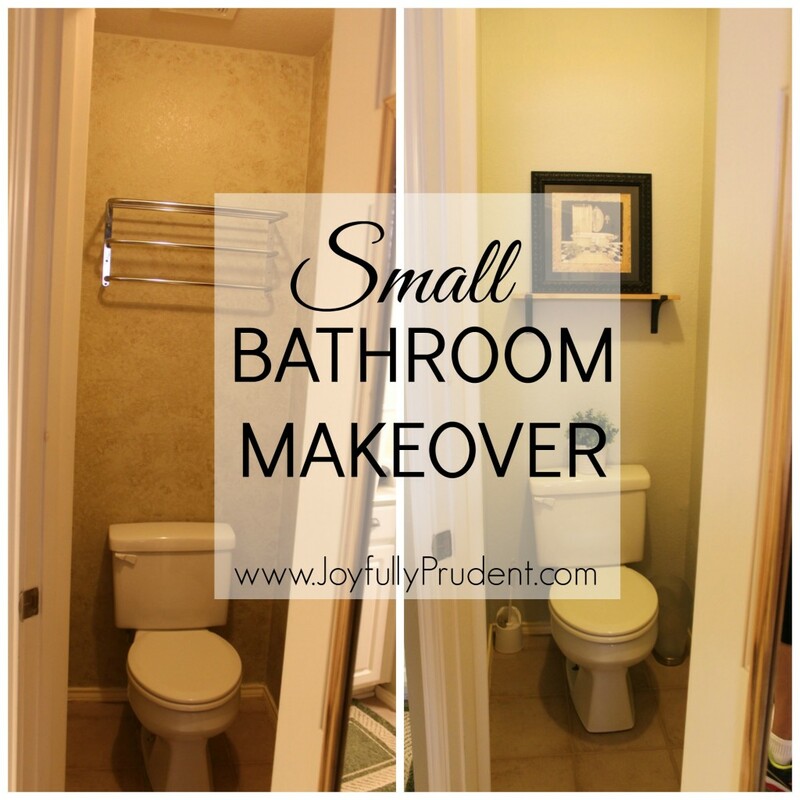 I kept this bathroom super simple since it’s such a small room. I’m no photographer, but the true color definitely does not show in this picture. 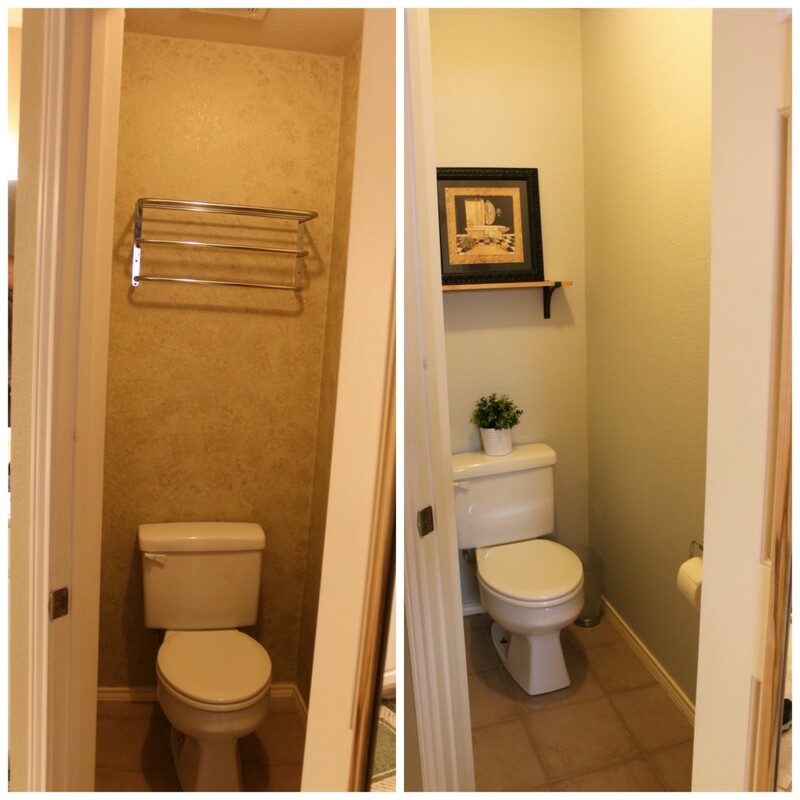 I’ll say the bathroom looks much better in person. I know that toilet brush is an eye sore, but when I leave it there I clean the toilets much more. 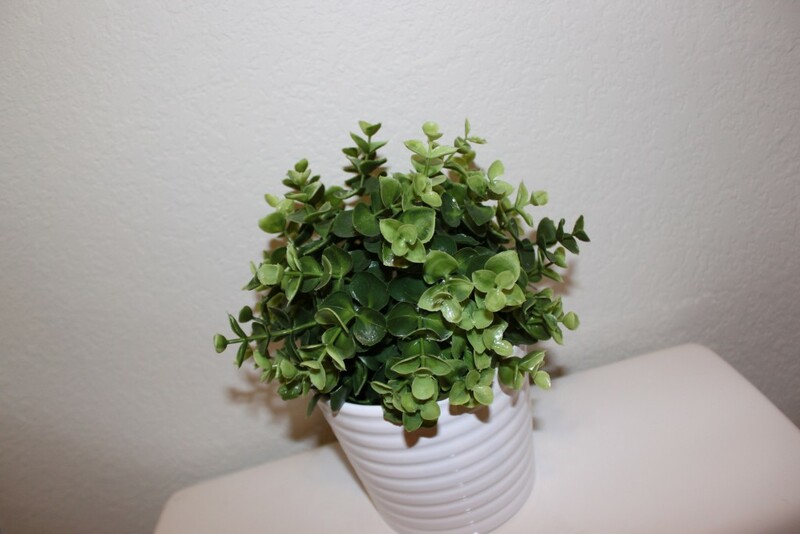 I don’t like the trash can shape, but I already bought it, so we’re going with it 🙂 I really love the simple look of the plant (from IKEA) and the shelf (from Target). The art on top was from our guest bathroom. 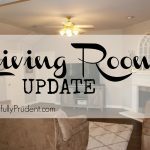 I still need to paint the baseboards white (all of our baseboards, trim, and doors are off white…the most annoying color). 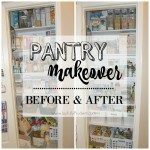 The makeover cost me the price of paint (I bought 2 sample sizes), the IKEA plant, and the shelf from Target. I don’t have the receipts in front of me, but it all cost around $30. 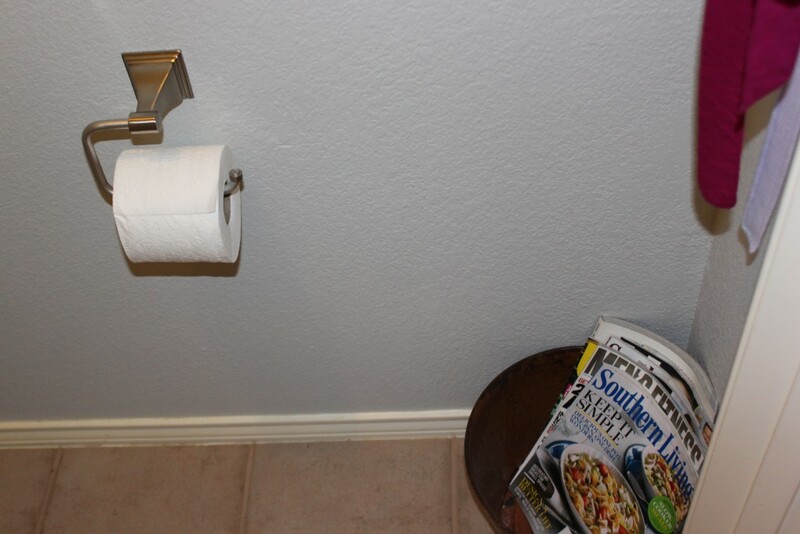 As I’m writing, I realized I added a new toilet paper holder, so that added about $10. I should have kept the old one, but I thought I was going to do something totally different and ripped it out of the wall. But then I ended up going back to a wall mount. I got this from Target too. 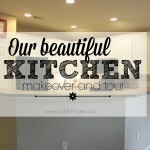 See the baseboards? Ugh. I’m slowly painting all the baseboards in our house. That little change makes a huge difference I have found. Hopefully I can repaint them soon. 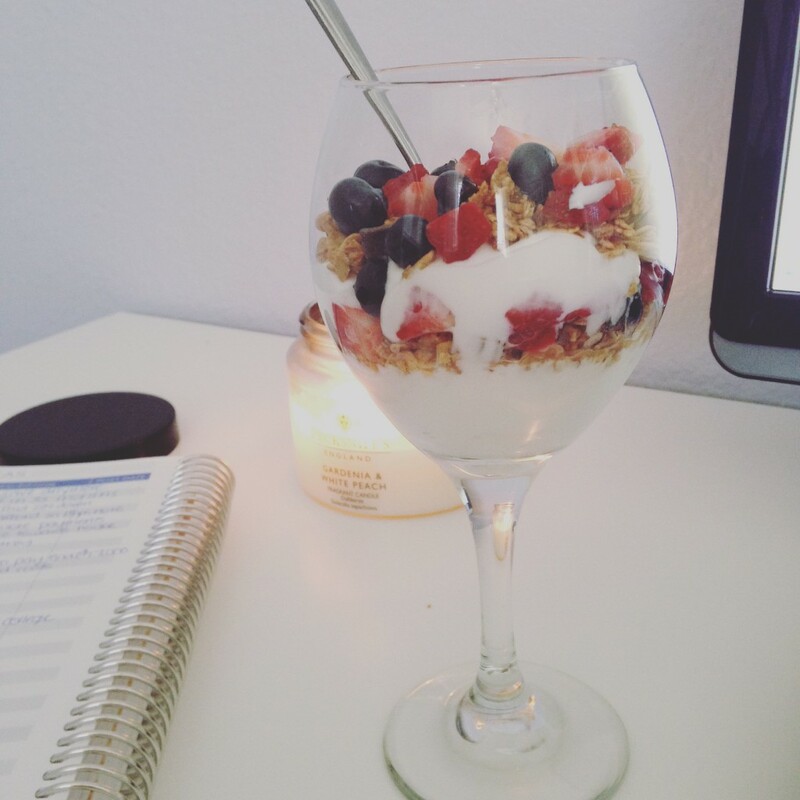 I rarely take the time to make a yogurt parfait, but when I do, I always love them. I made this one with plain non-fat greek yogurt, some granola, some berries, and a drizzle of agave nectar. This stuff is so good and quite filling. The yogurt has a lot of protein in it. I ate this fancy version when the kids were at preschool. The boys are wrestling a lot lately. 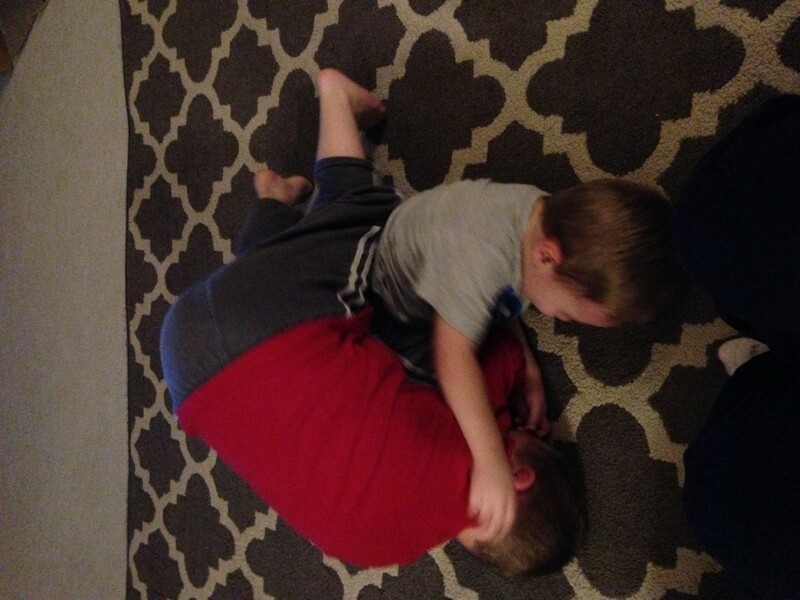 Maddox is a pretty easy going kiddo (much meeker than B), but when it comes to wrestling his brother, it’s all on! It’s hard for me to not break up their wrestling, but I guess that’s what boys do. 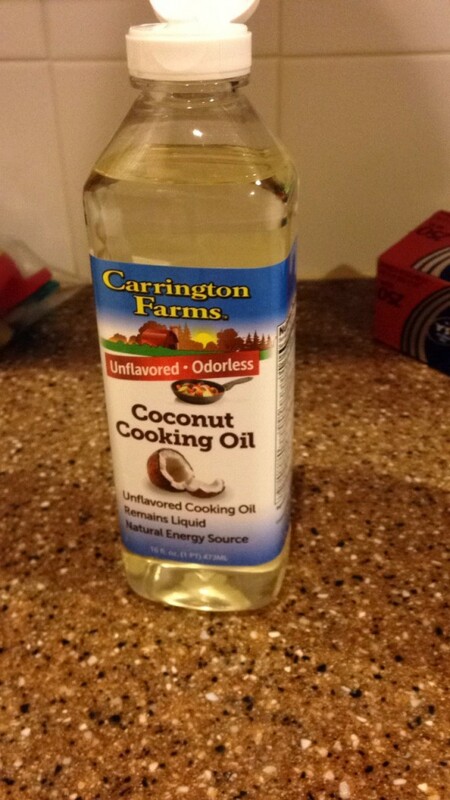 I love this stuff…so easy to use when you want your coconut oil in liquid form. Melting coconut oil before you use it isn’t hard, but this makes it even easier. I use this a lot when scrambling eggs or baking. 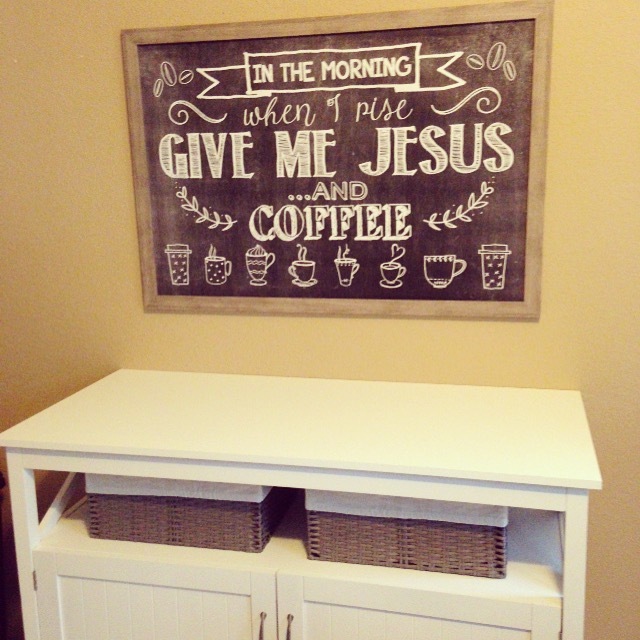 You might have seen this on my Instagram, but it’s a sneak peek at my new coffee bar. I actually finished it (for now) last night and will show some pictures soon of the final look. Maddox has become a dancing machine. 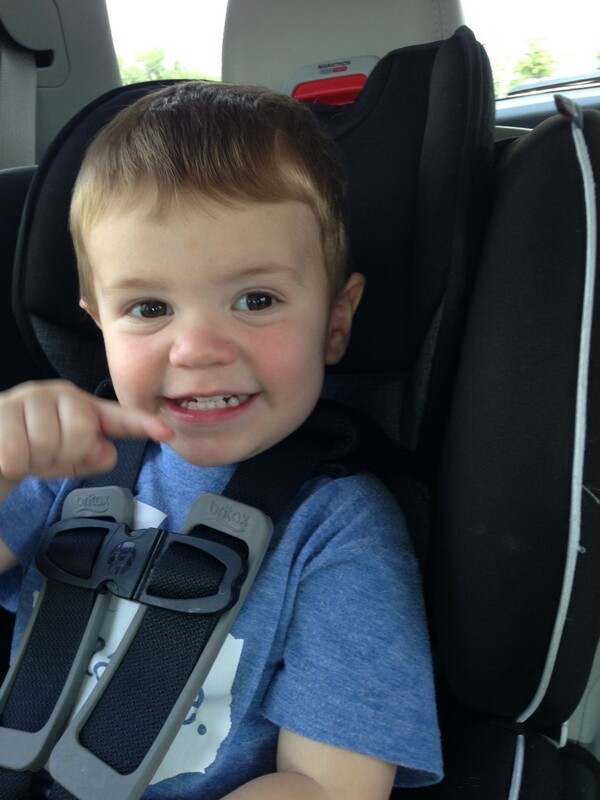 He learned this new song at preschool and it’s the motions of brushing your teeth. I love seeing his cute little teeth, so I tell him to “brush his teeth” when he’s dancing. Such a sweetheart. 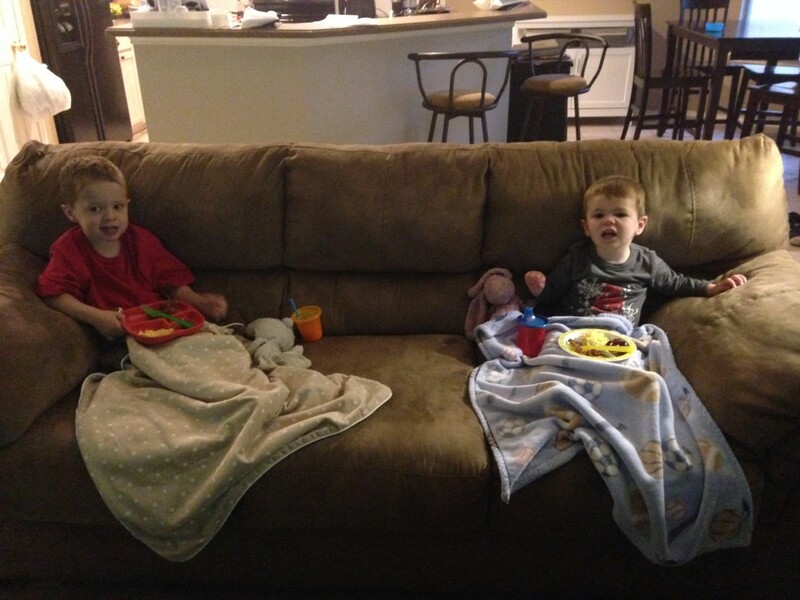 I don’t let them eat meals on the couch, but a couple of mornings ago, I let them eat their breakfast and watch a show. 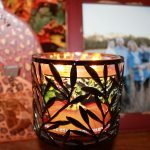 Sometimes, mama just needs a few minutes of stillness! 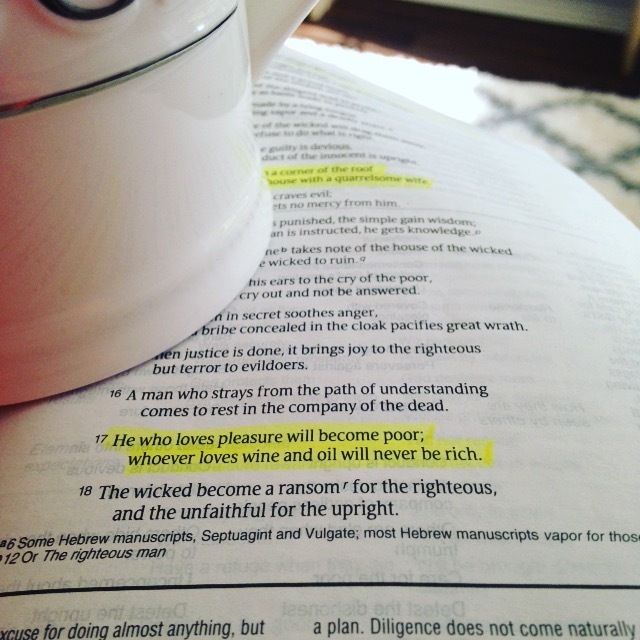 Lastly, one of my favorite moments was reading my Bible with coffee. I came to this verse and it was a great reminder that we should not be fooled by people who look like they are living millionaire lifestyles? Did you know that most people (not all, but most) who look like they live the millionaire lifestyle, are actually not millionaires in reality. And they are on the treadmill of trying to keep up with their current status. I often have to remind myself that my earthly riches will not matter soon…it’s what I’m storing up in Heaven that will last for eternity. This is from Proverbs 21. 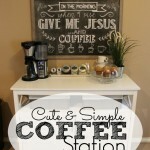 Link Ups: Friday Favorites with Erika, Narci, and Andrea.